Mrs Ken describes her painting as Walka. Walka is any meaningful mark or pattern and may be an image on a cave wall, on rock or on sand and has cultural and ritual significance. It is used on the body during inma or ceremony. 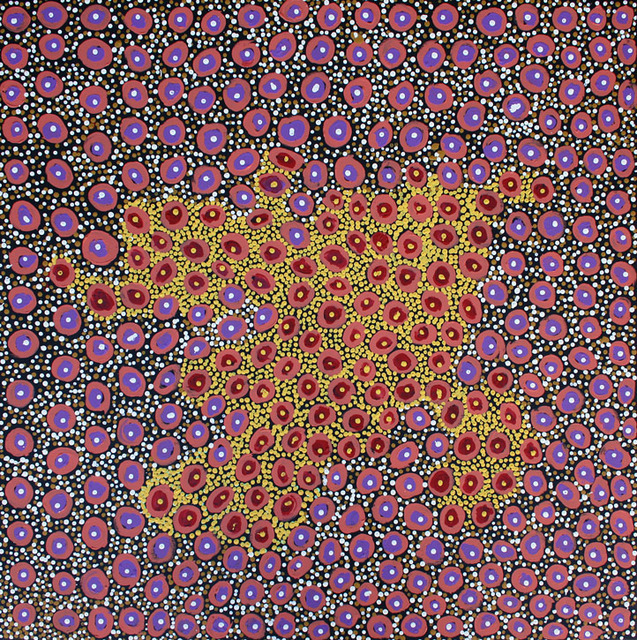 This painting is of tjulpun-tjulpunpa – desert wildflowers. Mrs Ken’s images reflect the physical and cultural landscape of her homeland in the desert which is rich in wildlife and colour, changing with the seasons. As an elder she is custodian of stories and cultural lore passed down through the generations.